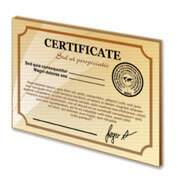 USBid's commitment to quality is backed by third party certifications and industry affiliations. At USBid, we believe that customer satisfaction requires the industry's highest standards for quality. We actively maintain certification requirements and continue to look for additional standards to promote the highest level quality products and services to the market. USBid's company policy is "Customer Satisfaction through continuous improvement" and quality is the foundation for achieving our goal. 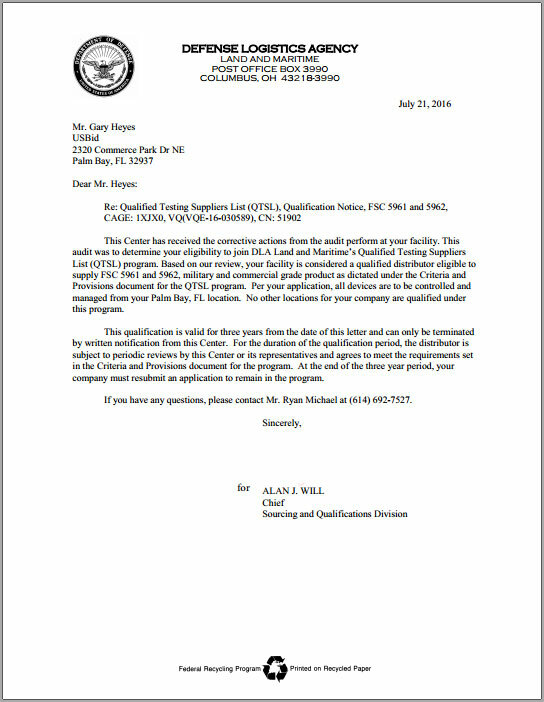 QTSL - Establishes a list of pre-qualified distributors for Federal Stock Classes (FSC) 5961 (Semiconductors) and 5962 (Microcircuits) products that are purchased and managed by DLA Land and Maritime. All distributors listed have demonstrated compliance to the Criteria and Provisions for Qualified Testing Suppliers List (QTSL) booklet. The term of qualification is 3 years and distributors must reapply at that time to remain in the program. USBid was qualified in July 2016. QSLD - Establishes and maintaines a list of pre-qualified sources for certain electronic components that are purchased and managed by DLA Land and Maritime. QSLD products are provided by suppliers that combine accepted commercial practices, quality assurance procedures that are consistent with industry and international quality standards, and tailored when necessary to product-unique requirements that can take the place of provisions traditionally stated in DLA Land and Maritime solicitations. USBid was qualified in July 2016. 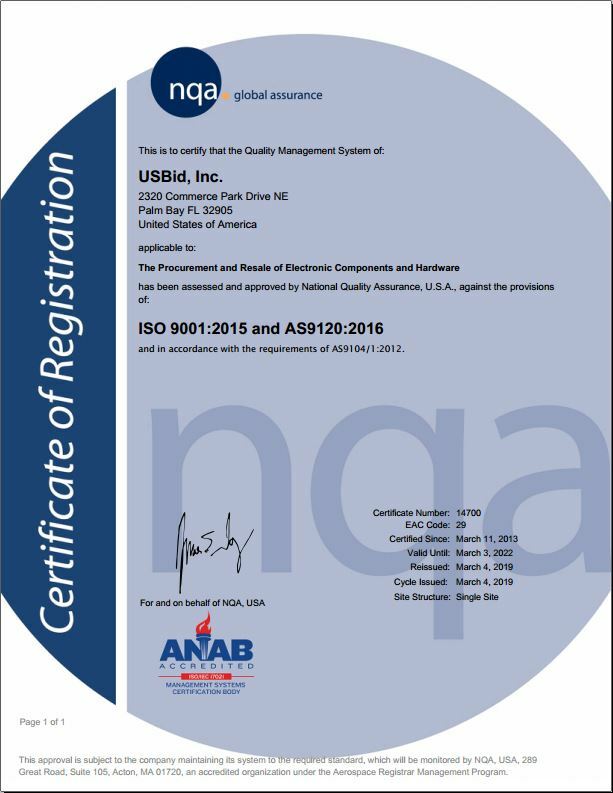 AS 9120B:2016 - The AS9120B:2016 Standard specifies requirements for a quality management system (QMS) for distributors to the Aircraft, Space and Defense industry; it also includes all ISO 9001 QMS requirements. The AS9120B:2016 Standard is applicable to organizations that procure and resell parts, materials and assemblies to customers in the Aerospace industry, including partial lot quantities. ï¿½It helps ensure proper material handling, and tracking of the part from OEM to customer, including chain of custody, traceability, control and availability of records. ISO 9001:2015 - ISO 9001:2015 specifies requirements for a quality management system that demonstrates a companyï¿½s ability to consistently provide product that meets customer as well as applicable statutory and regulatory requirements. The ISO 9001 Standard is also used to enhance customer satisfaction through the effective use of processes for continuous improvement of the system and the assurance of conformity to customer and applicable requirements. The requirements for this Standard are intended to be applicable to all organizations, regardless of type, size and product provided. ESD S20.20/2007 Compliant - In order to meet the global need in the electronics industry for technically sound ESD Control Programs, the ESD Association has established an independent third party certification program. The program is administered by the ESD Association through country-accredited ISO9000 certified bodies that have met the requirements of this program. USBid has been ESD S20.20/2007 Compliant since 2008. 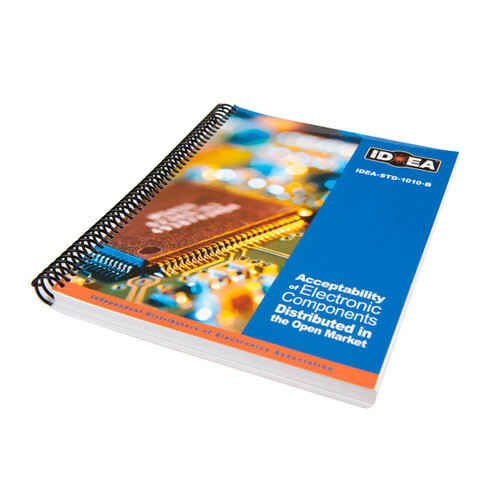 IDEA-STD-1010-B Compliant - The first inspection standard addressing the needs for the inspection of electronic components traded in the open market. This standard is a must for quality assurance and inspection departments. USBid has been an active participant with IDEA since 2009. ERAI Member - As the world's largest database of non-conforming material, ERAI is leading the fight against the sale of counterfeit and high-risk components and promoting a higher level of awareness via data-sharing, education, training and networking. 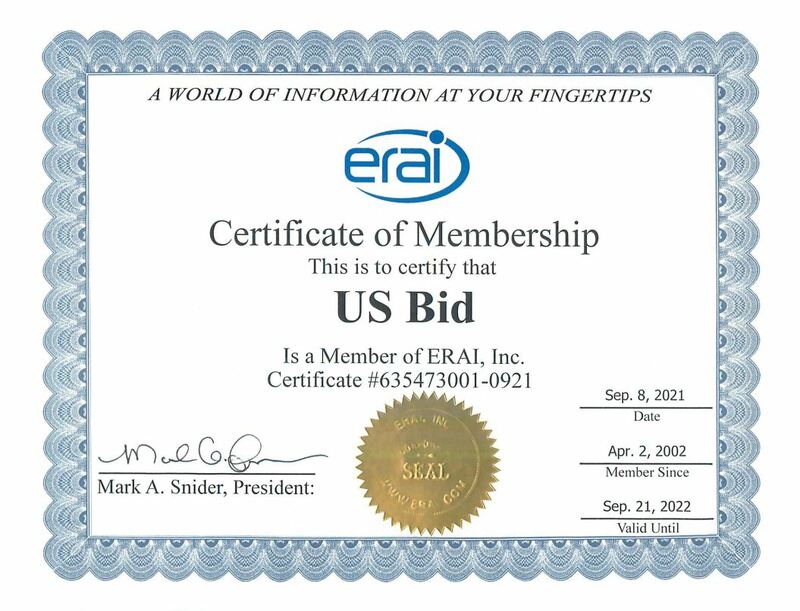 USBid has maintained it's membership with ERAI since September 2002. GIDEP Member - GIDEP is a cooperative activity between government and industry participants seeking to reduce or eliminate expenditures of resources by sharing technical information. Since 1959, over $2.1 BILLION in prevention of unplanned expenditures has been reported. 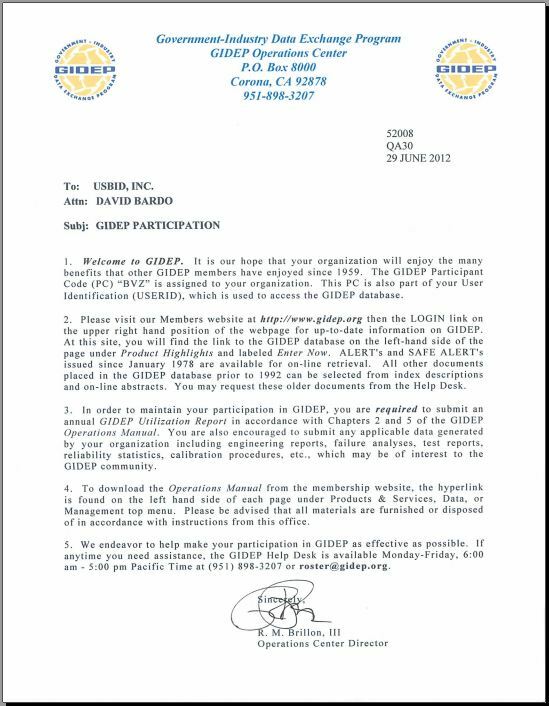 USBid is proud to have become a GIDEP member in June 2012. Cage Code 1XJX0 - The Commercial And Government Entity Code, or CAGE Code, is a unique identifier assigned to suppliers to various government or defense agencies, as well as to government agencies themselves and also various organizations. CAGE codes provide a standardized method of identifying a given facility at a specific location. USBid currently maintains an Active CAGE code which was Established March 11, 2002.